This tutorial is for complete beginners, so if you want to make outfits but have no idea how, this tutorial is for you. Ok, important things first. You are going to need a few tools to get you started. This is the most important thing, some people make outfits without the level editor but that's a very bad idea. The level editor is what you will test your outfit in. The Level Editor (LE) is what comes with Tomb Raider Chronicles (TRC), if it didn't (If you got it as a jewel case or off of Ebay maybe) come with TRC , then you can download the Level Editor. If you want to make meshes for Lara, (If you don't know what meshes are, they're basically Lara's Polygons. The thing that makes Lara 3D) then I'd suggest Meta. Meta is a ton easier to use then, say, programs like 3D studio Max, Rhino or Gmax. I've worked with all of them, and I learned Meta in 10 minutes, as for the other tools, I'm still learning. A photo enhancing tool is great for making textures. The best are Photo shop pro and MGI photo suite. If you don't want to download a demo of those or buy them then the next best thing is to go online and get textures from web page background sites and resize them in Paint. Ok, don't try making your own textures in paint, no matter how good you are it'll probably look very bad. The internet textures will probably be good looking enough for your outfit. Assuming you've installed your level editor by now, and all the needed programs listed above, then you're ready for the next step. 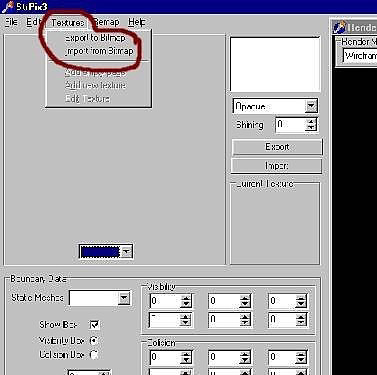 StripX is not a hard program to use, it's got a simple layout. Click open, and you will find your WADs under: program files - Core design - TRLE - Graphics - WADs. 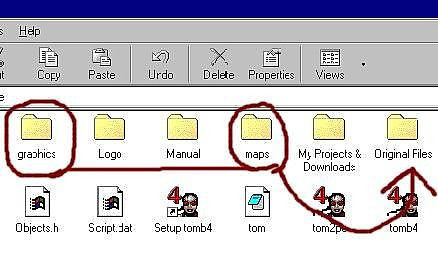 If you haven't already, make a back up copy of your ''Graphics' and 'Maps' folder. Make an "Original files" folder. This files are often saved over, and you can't get them back unless you reinstall the level editor, or download them. Loading & Saving Textures: Are you ready to texture? Texturing is not hard, so don't sweat it. Load StripX and open the WAD you want to start with, let's use the Tut1 WAD file (Remember to make a backup copy of it before you start). 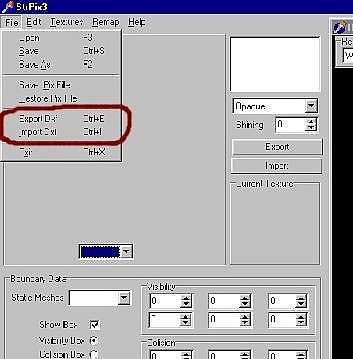 Ok, on the task bar at the top there is a button called "Textures" click on it and a bar will appear beneath it, it says 'Export bitmap' and the other says 'Import bitmap'. Basically: Export = save, and import = load. Click on 'Export bitmap' and save your texture to a folder that you wont forget how to get to. ( :p ) What that does is it saves all of the textures from all of the objects in your Tut1 WAD into a picture format. It will be the exact same thing as the textures to your right when in StripX. Choose your best photo enhancing program, one that you know how to use, and load the Bitmap that you just saved. It might look like a lot of textures, but zoom in and start at the top. It might look overwhelming but you'll get used to it. Take a look at the textures, you'll see that they're all squares, well ok, some are rectangles. 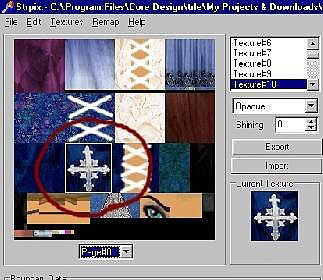 (If you've explored any in StripX you will have noticed that if you select a texture it will have a little white box around the texture that you clicked on. They are many textures put into one big picture.) Ok, have you gotten or made any textures for your outfit? If you haven't then go online and search for some good outfit textures or make your own. If you're loading a picture into you're texture set then you'll probably need to resize it. You'll need to make the picture you loaded the same size as the texture you want to replace it over. If the texture is too big, when you load it in StripX the white box will only take a piece of it, and if it's too small it'll take off of the texture behind it. It might sound confusing, but they best way to understand it is too test it your self. And if you make a mistake, you can always save your modifications as a separate file then the original texture. Or load the original Tut1 again and save the texture from StripX. Once you're finished making your textures, load it (Import it). It will take maybe 5 seconds at most to load them all. When you first load a WAD it'll be in Wireframe mode. Look to the top right of your screen where the wireframe mesh is. See the little gray box? Click on it, it'll say four things, "wire frame", "Solid", "Texture" and "Points". Now, scroll down to Texturing. You'll now see some parts of Lara. She made up of several pieces and you'll need to texture each part you want to change. If you scroll through the meshes you see lots of pieces of Lara and some of her objects and enemy. Feel free to look, but all of Lara is located in the first part of your WAD. To place a texture, click on the texture you want then click on the place you want the texture to go. When you get to Lara's face, you'll probably notice that when you place new lips that it looks odd. That's when mirroring or flipping the texture is needed. The Left click places the texture, Alt rotates, Shift mirrors and Ctrl selects a texture from the mesh (Ctrl isn't needed much). Loading & saving Meshes: Select the mesh you'd like to modify/change. 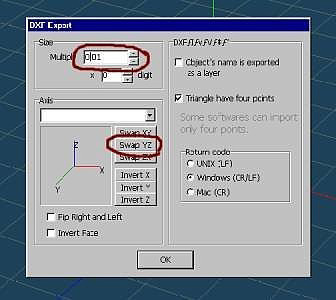 Let's say you want to change her chest, then go under file and you'll see 'Export DFX' and 'Import DFX'. Remember, just like with the textures, Export = Save and Import = load. The DFX is the file that the mesh is saved in. Ok if you're going to use Meta then read this, if not then this probably won't do you any good. Load Meta and open the mesh you saved. It'll come up with a box (See first meta picture for reference). Multiply should be: 1.000. 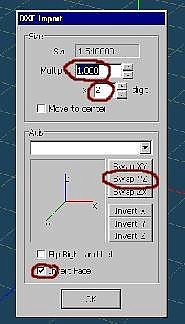 Digit should be: 2 .Axis: Click on Swap YZ . And do the check box for "Invert Face". The basic tools that'll you'll need want to learn how to use: Create, Primitive, Extrude, Mirror & Delete. Don't use "Knife" for now, it cause's holes most of the time. And a good little feature is if you want one point to join to another point just drag the point to the one you want it to connect to and right click once. It won't work if the two points are not close. (Don't forget that Meta includes a tutorial in it's files on your hard drive. If you have problems). And to save the DFX, Multiply should be: 0.01 . And click Swap YZ. See second Meta picture for reference. Making a high polygon outfit is difficult and may cause problems. If you're in StripX you'll see some numbers in the bottom left corner. The one that says Vercites, if the number is above 255, the outfit probably will not work when you test it. If you want to use a mesh that someone else uses then load their outfit and save the mesh you want then load it in your outfit. But do not forget, they spent time working on that mesh! So credit them. 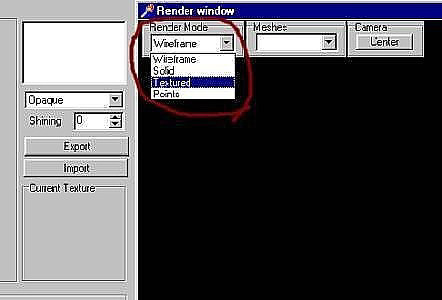 If you include a ReadMe file with your outfit (Under the start & accessories bar there is a 'notepad', that's a great program to make simple ReadMe's) then say in that readMe something like: 'The head mesh was made by - their name here!-. The same goes for textures, if you use a texture, credit the person who made it. If you don't know who made it then state that you didn't make it but don't know who did. Ok, one last thing about credits, I promise, most authors like it if you add credits in the description of your outfit when you add it to the site. Last but certainly not least. For a first outfit there is no need to over do it, no one expects a first outfit to be a master piece. Even experienced outfit creators have bad outfits from time to time. But the best thing to remember is if you make a ugly outfit is that maybe the outfit wasn't a success to other people but it is a success to you. If you learn from that outfit your next outfit will be better. Don't give up just keep trying, you'll get better, I know you will.